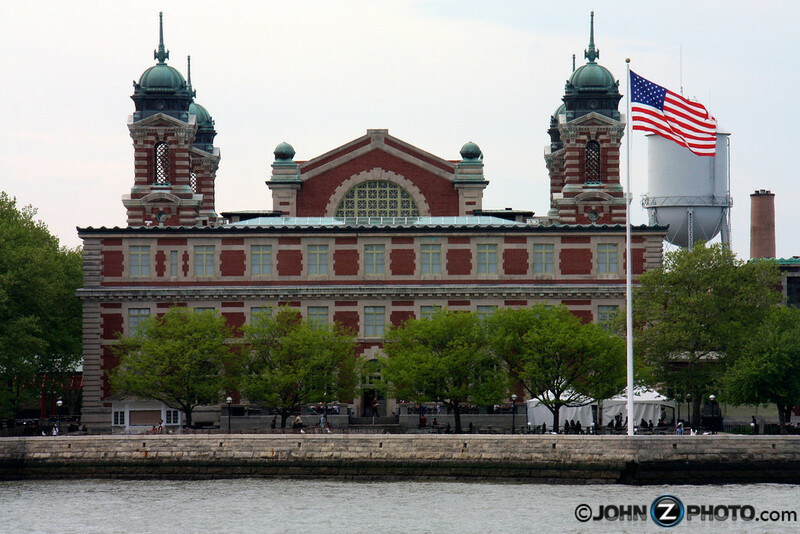 Many people know about Ellis Island and the beautiful immigration Museum. It’s a beautifully restored building sitting just off the coast of New Jersey where thousands of people immigrated to the United States. It particularly holds a special place in my heart because it’s also where I proposed to my wife. 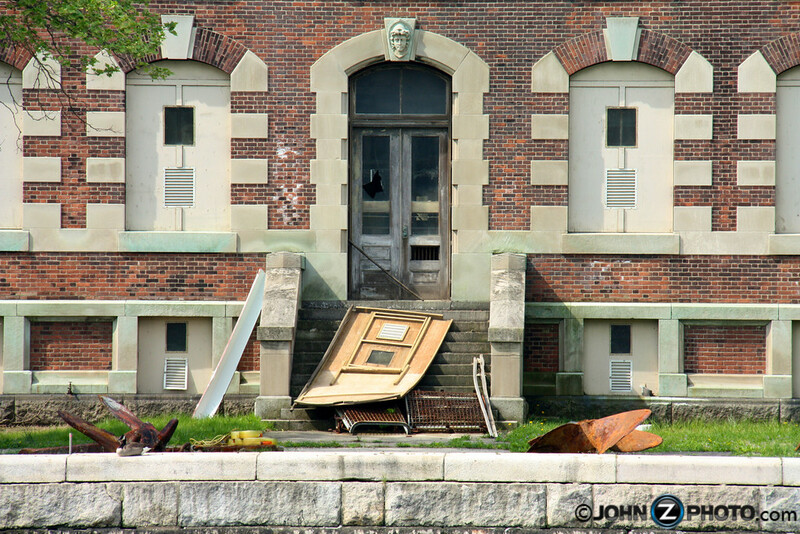 But just across the dock sits many abandoned buildings that once made up the most sophisticated hospital complex and infectious disease wards in the world and you’re about to take a rare look inside. 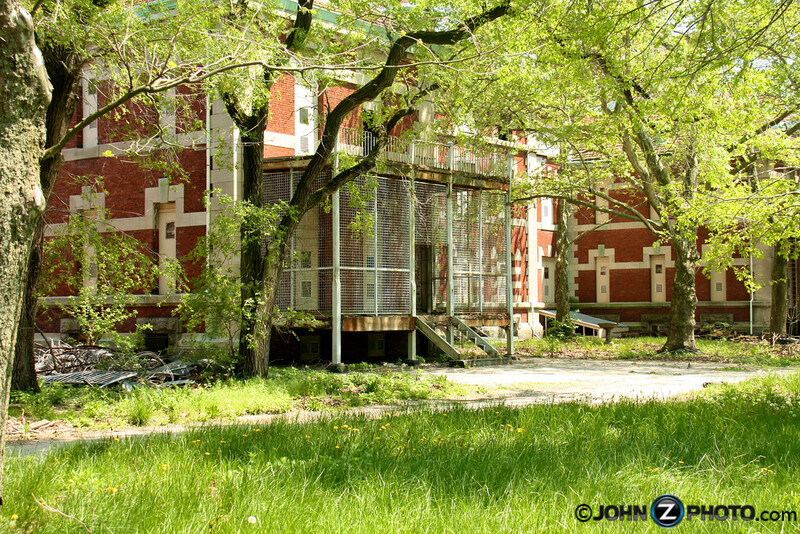 Here is a wide view of some of the south side buildings that currently sit empty and deteriorating. These islands are man made with material excavated from the creation of the New York City Subway system. 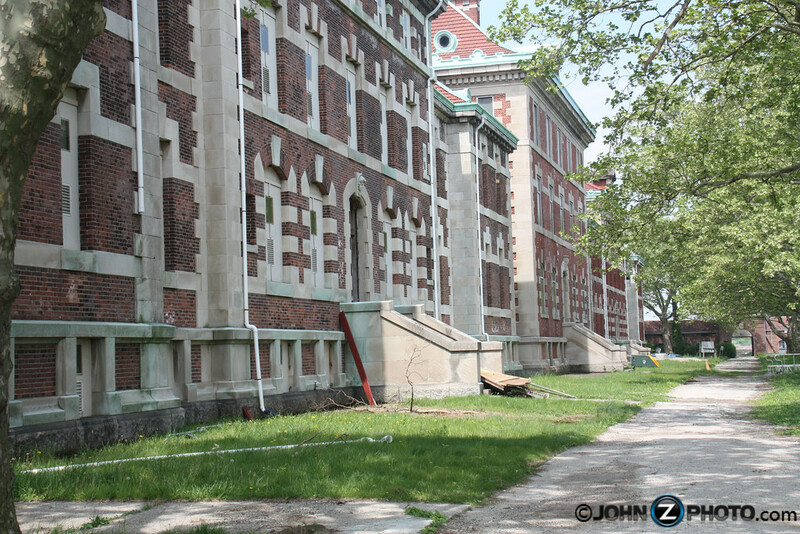 Recognizing the historical significance of these buildings, the non profit group SaveEllisIsland.org has been hard at work to raise the funding needed to restore these buildings and put them to beneficial public use. 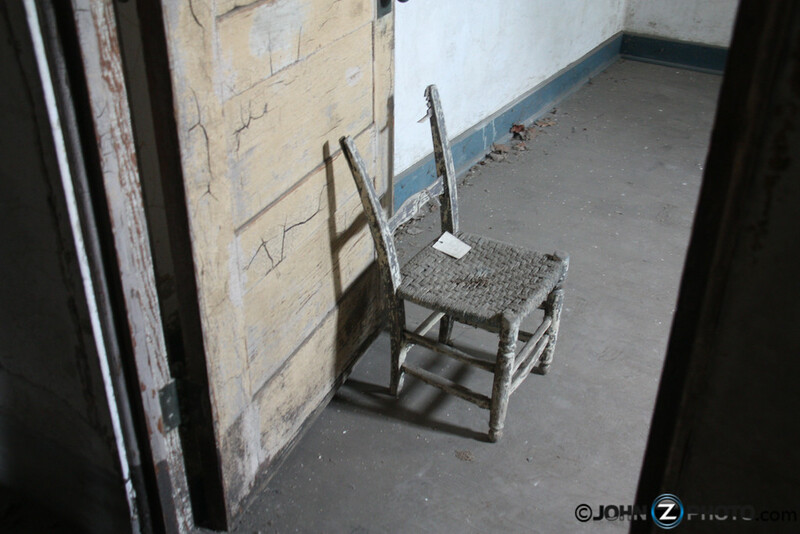 In 2010, as a Save Ellis Island supporter, we were granted a tour of these abandoned buildings and it was truly an amazing experience. This looks like a giant washing machine located in the laundry building. 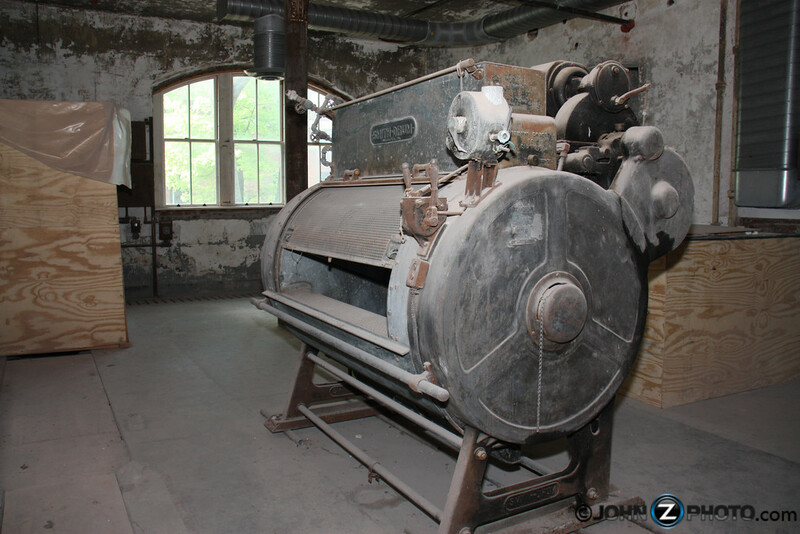 Check out this giant piece of machinery known as “The Mangler.” Located in the laundry building, it was used for drying and pressing sheets. Ellis Island operated from 1892 to 1954 as the country’s largest immigration inspection station and a “gateway” to the freedom of the United States. But not everyone was admitted directly into the United States. Many people were detained on the Island for further medical examination or for an unknown illnesses. At the time the facility was state of the art and doctors would come from around the world to learn new techniques and procedures. 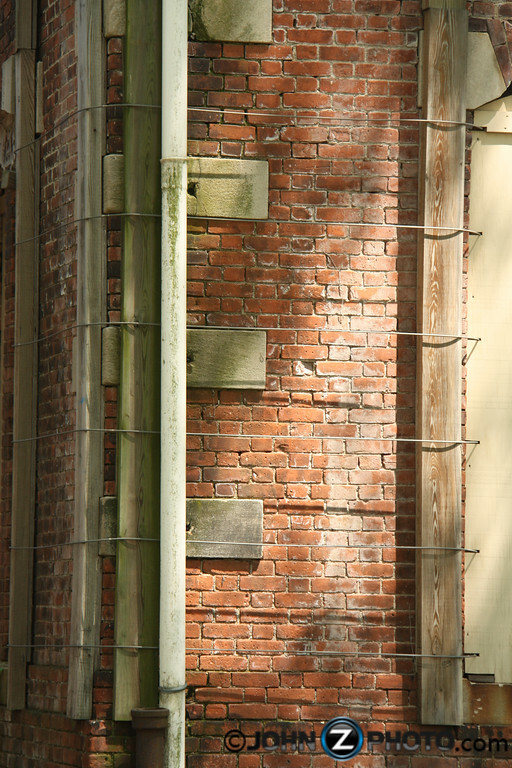 The buildings are very ornate and include many small architectural details. Today, the South Side of the Island is almost entirely closed to the public. The windows and doors are boarded up and have special windows and vents to prevent moisture, mold, and mildew. 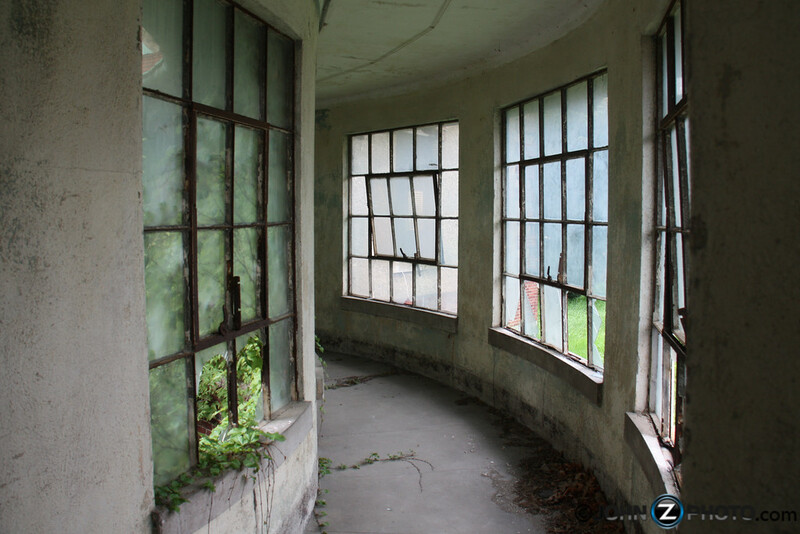 Taking a look inside, it’s easy to see that time and the elements have taken their toll on the once mighty hospital. 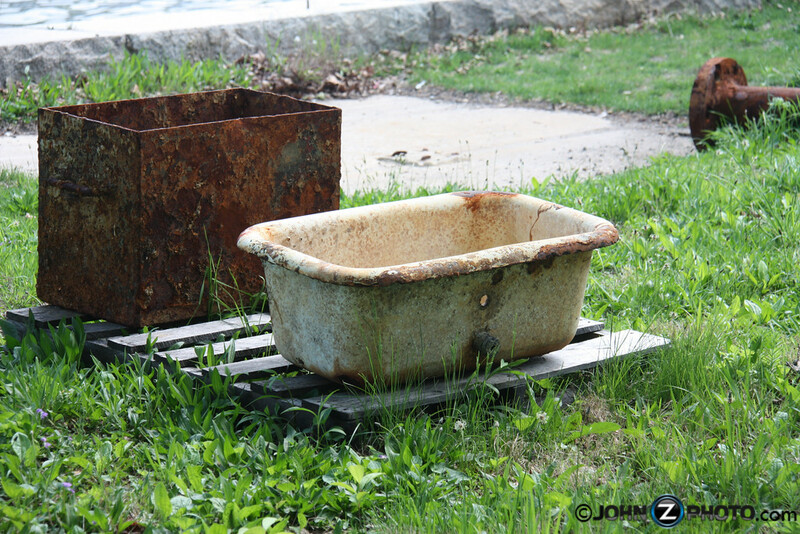 Would have looked like this during the island’s operation as an Immigration Station and infectious disease ward. 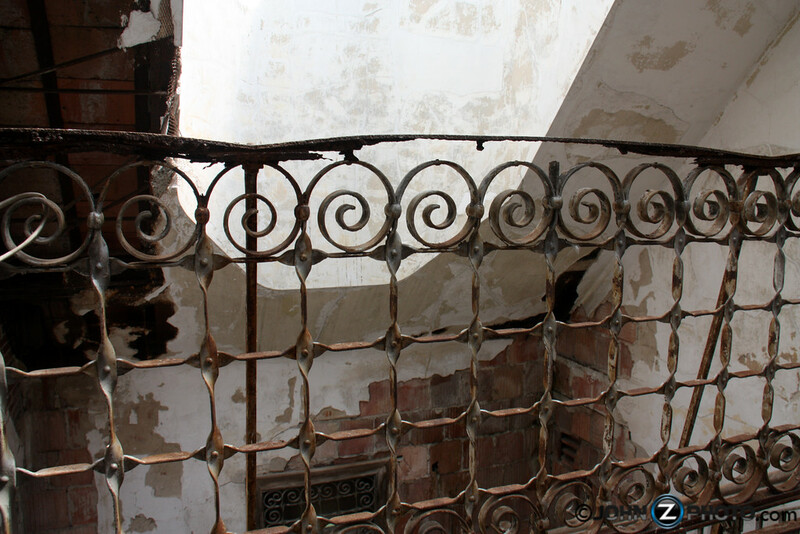 Even in its deteriorating state, you can really appreciate the beauty of the ornate scroll work on something as simple as a railing. For many years, the remains of the ferry boat “Ellis Island” could be seen partially submerged in the waters just off Ellis Island. 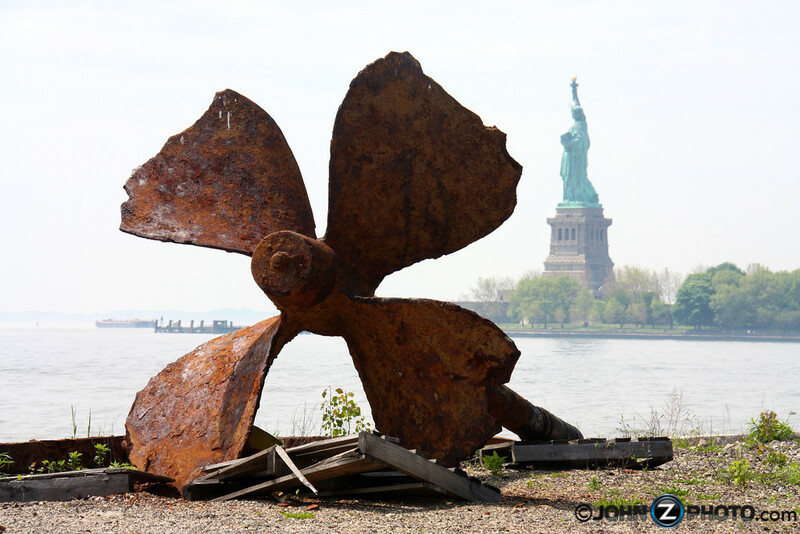 Recently the ship was removed from the water and some of the remains were salvaged. Seeing things like this really makes you wonder how many people may have been shuttled to the island on this ferry from their big steam ship. I can only imagine what they were thinking as the saw the towering Statue of Liberty for the first time. The view of New York City was so close, yet still seemed so far away. 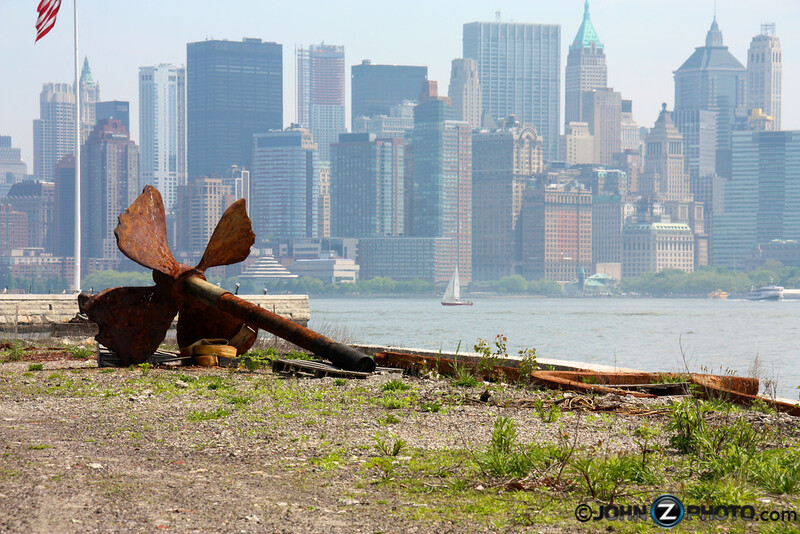 Remains of the ferry boat “Ellis Island” with lower manhattan New York City in the background. 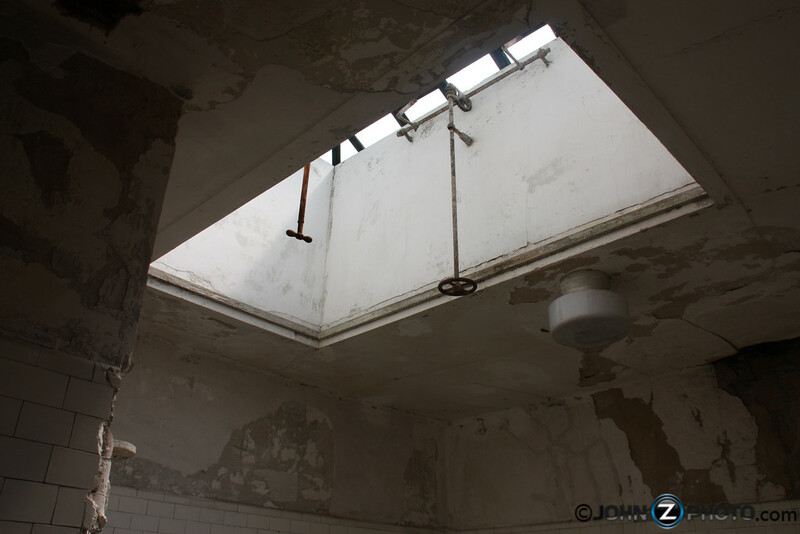 The operating rooms were placed on the upper floors of the buildings with large skylights to utilize natural sunlight during their operations. Recognizing the need to perform operations at all times, large bright lights were created and installed. 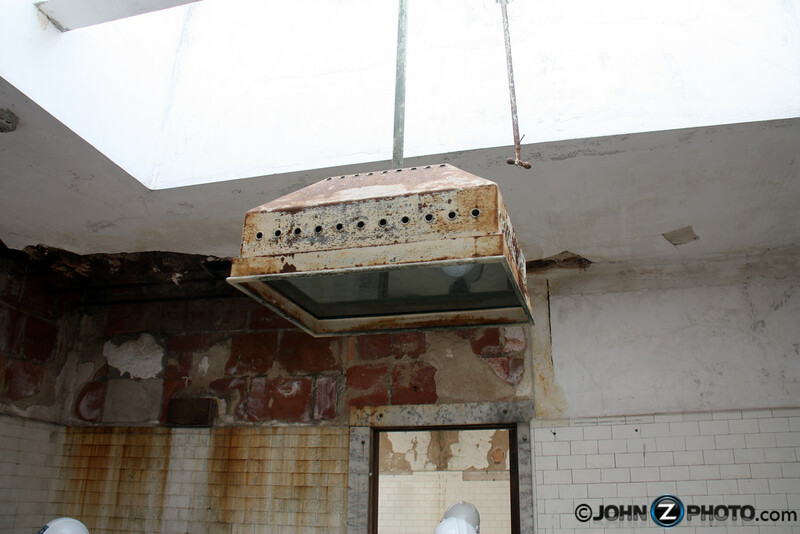 This is believed to be one of the first operating room lights in America. These lights generated so much heat that nurses had to frequently dab the surgeons forehead in order to absorb the sweat. A scene frequently portrayed in older movies. Here is what part of the operating room looks like today. 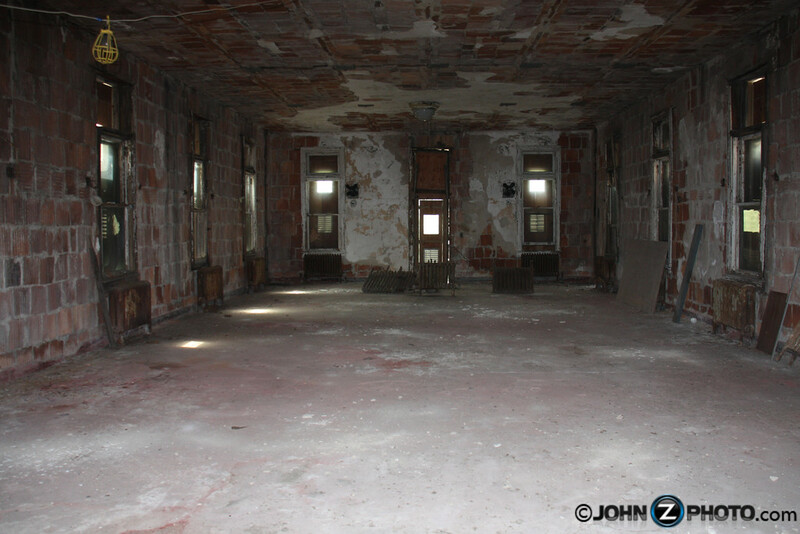 Here’s what that operating room would have looked like years ago. There are examples everywhere of how time has taken over. 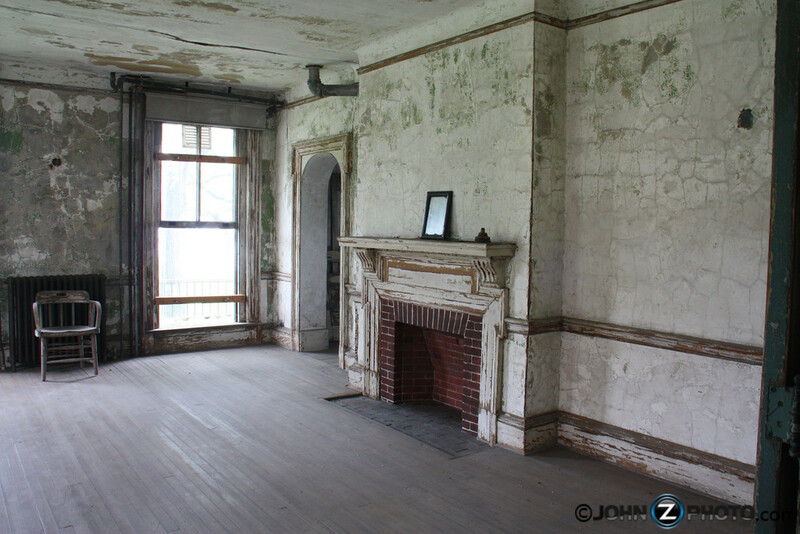 One of the highlights of the tour was a look inside a house on the tip of the south side of the island. 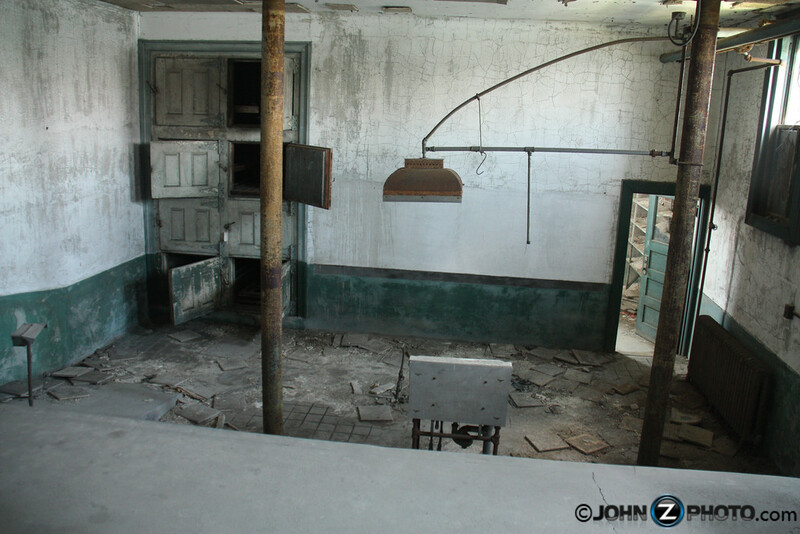 The house was originally built for one of the head doctors and his family. 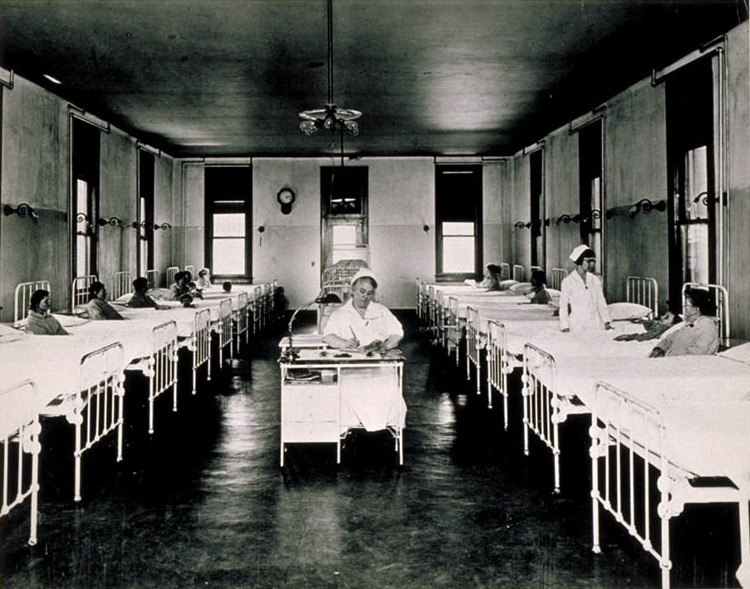 In fact he was so sure that the Ellis Island hospital complex was one of the safest infectious disease wards in the country, that he had his house connected directly to the infectious disease wards corridors. Anyway, back into the house. It’s beautiful with incredible views of Manhattan and the Statue of Liberty. I’m not sure if the doctor ever moved in, but the house was eventually used as a private residence for hospital staff. There is a fireplace in every room. It kind of makes you wonder how many doctors and nurses would be huddled around discussing their patients after a long day of work on the island. Because of its unique beauty and amazing look, this house has been rented by TV and Film production companies for photo and video shoots. 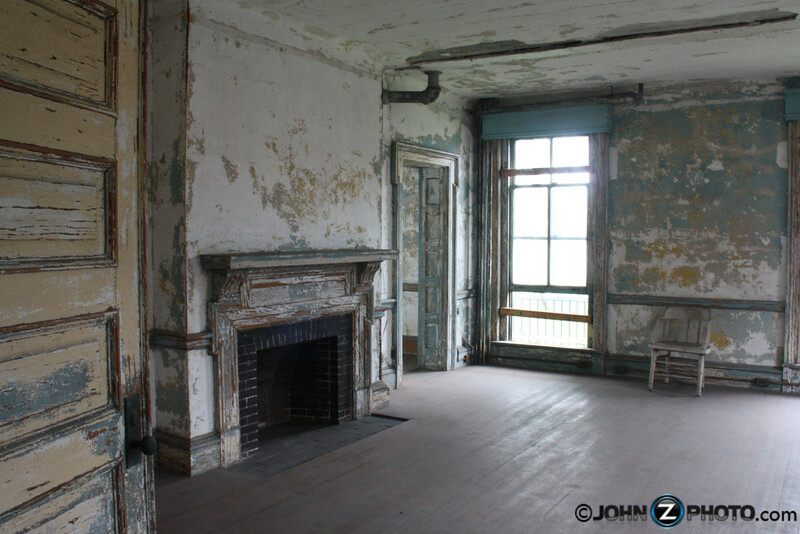 As an engagement gift, the great people at SaveEllisIsland.org granted us access with our photographer for a private photo shoot in this house. I won’t post those pictures here, but it was truly an amazing experience. Taking a look around the house, there are bits of history everywhere. 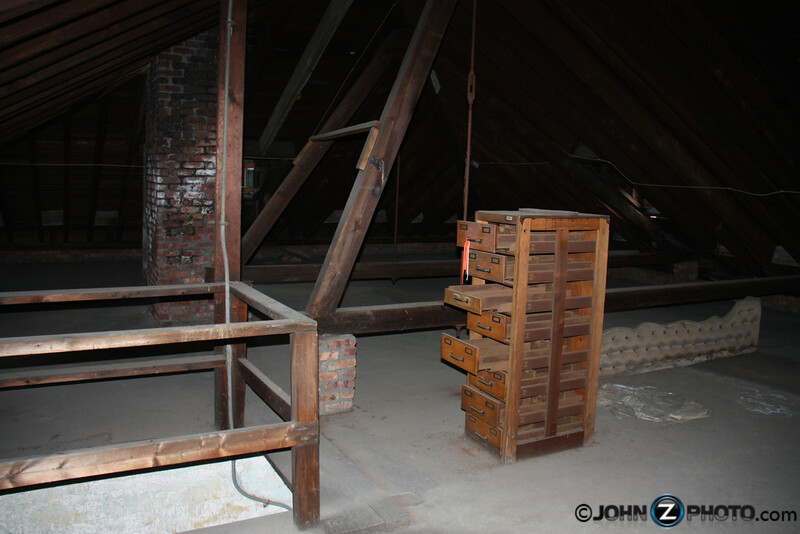 Take a quick peek into the attic and you can see a wooden cabinet. 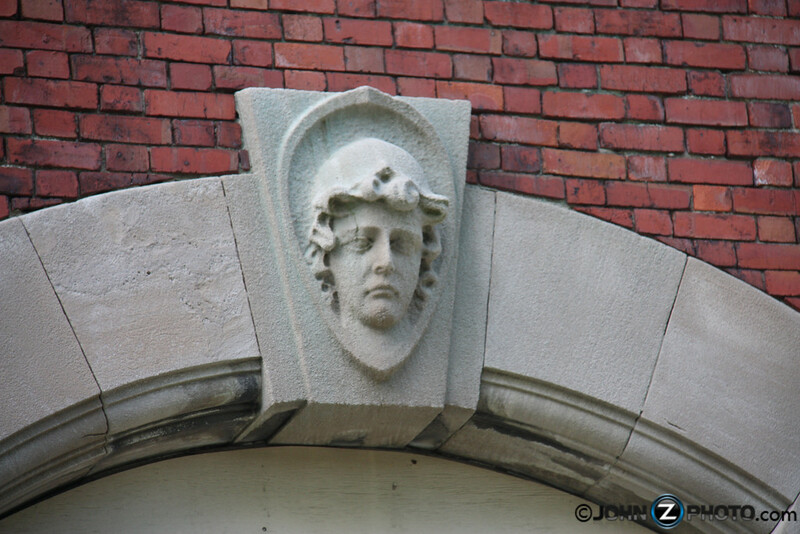 This was something that was preserved from the hospital complex. There were once hundreds of these that held patient records on little index sized cards. You can even see one of the old window valances in the background. 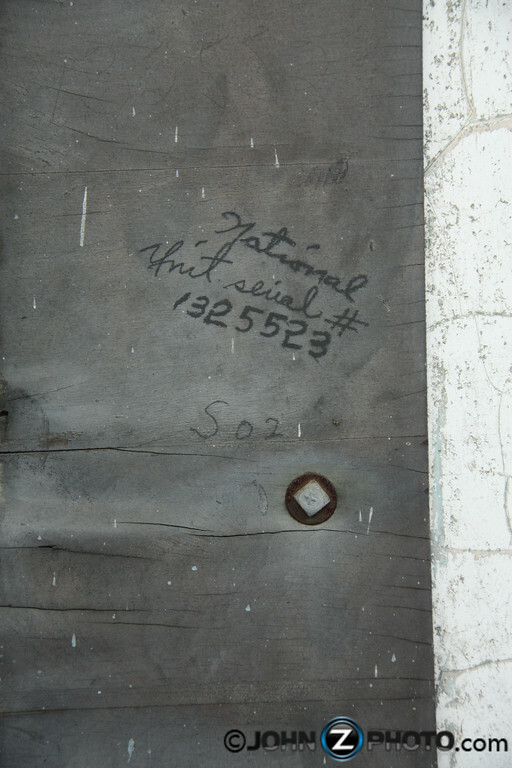 Filing cabinet in the attic of Hospital Staff Administrative House on Ellis Island’s South Side. Leaving the house and walking through the long corridors, it’s amazing what catches your eye. Seeing something like this chair brings a bit of reality into things. 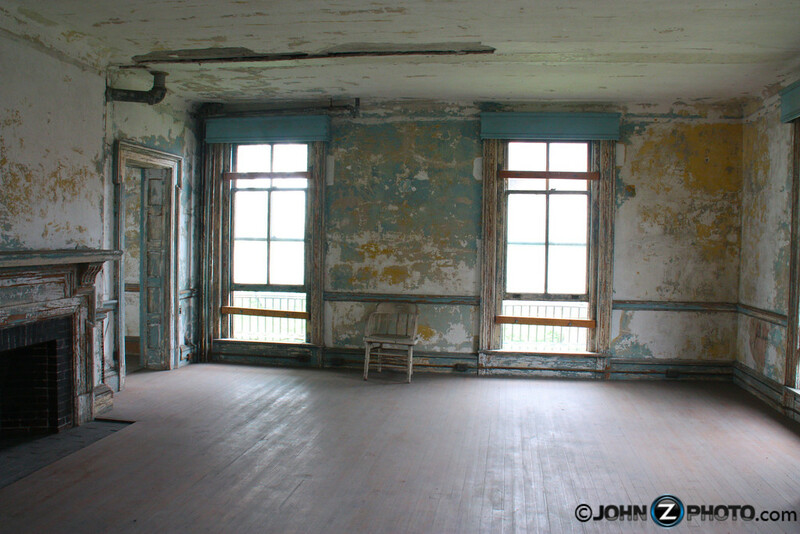 The halls and rooms were once filled with men, women, and children that could not yet enter the United States or may even be sent back to their home country. 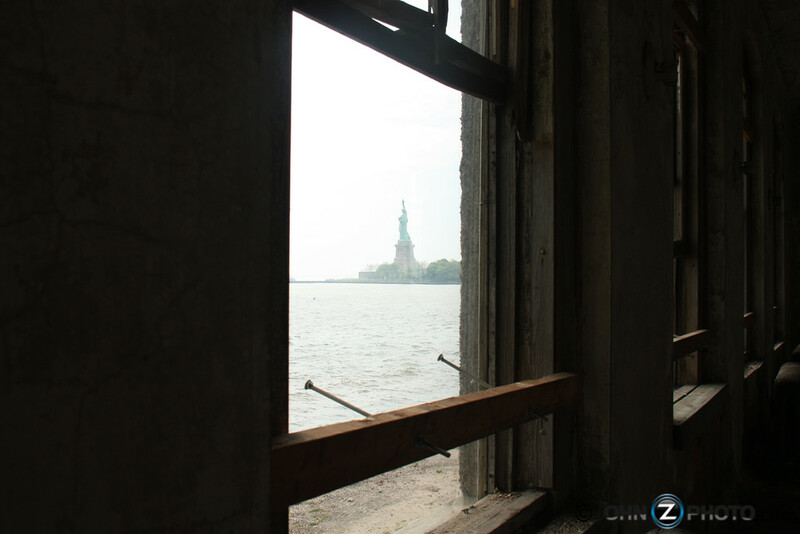 As the closest point to the Statue of Liberty, patients on the island had constant reminders that freedom was so close. 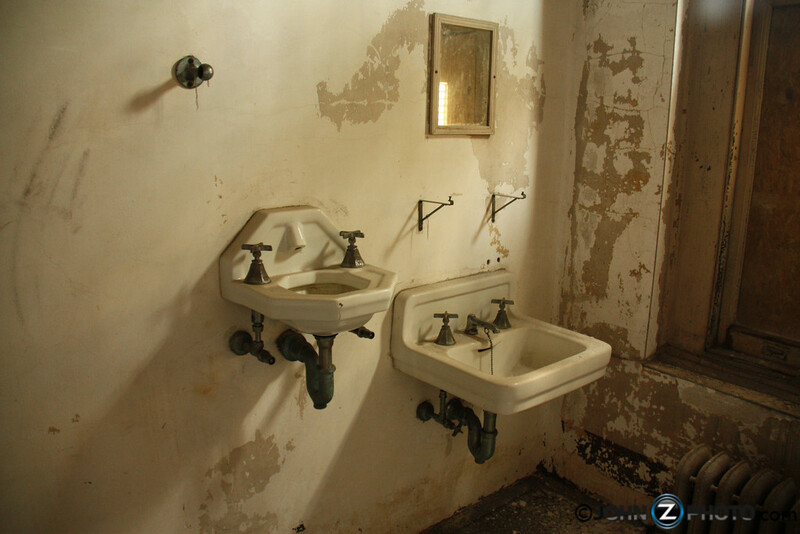 In one section of the hospital every room has double sinks. One high and one low. I can only imagine that this was done to prevent the spread of disease. Interesting walkways in the courtyards connect various buildings. 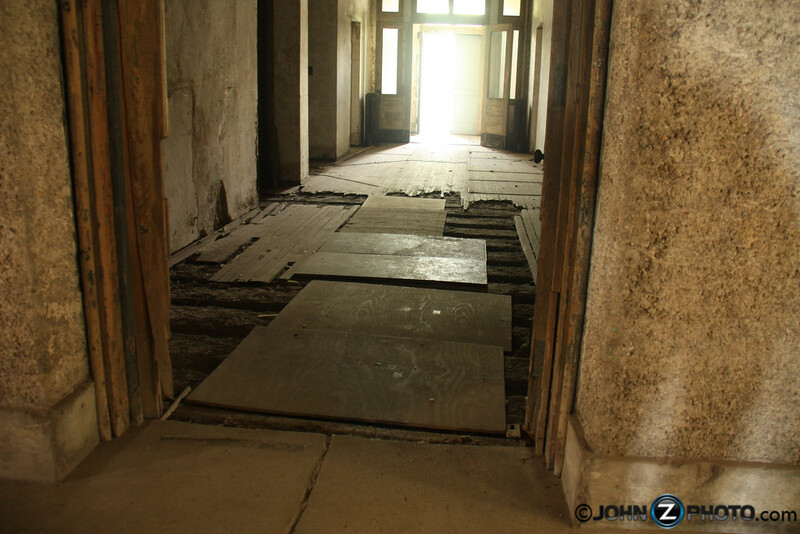 Some areas are so deteriorated that that floor has rotted away. 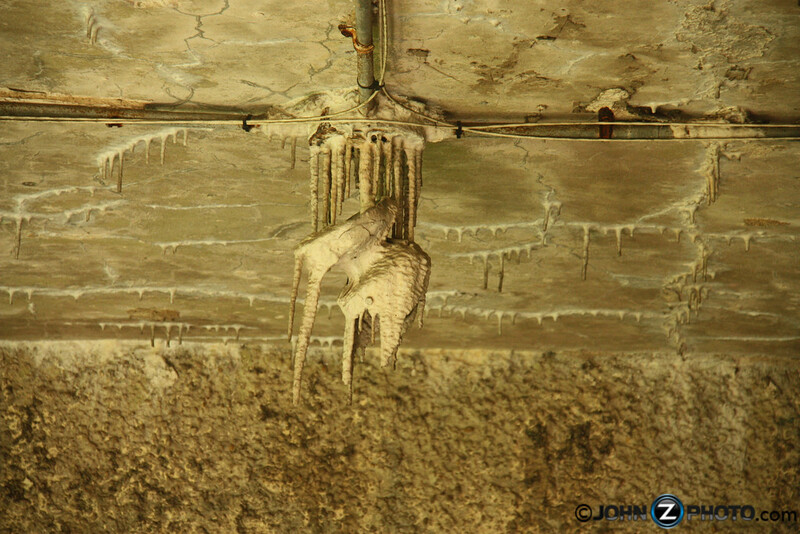 How many years do you think it took for this light fixture to become encrusted in salt from the sea water? 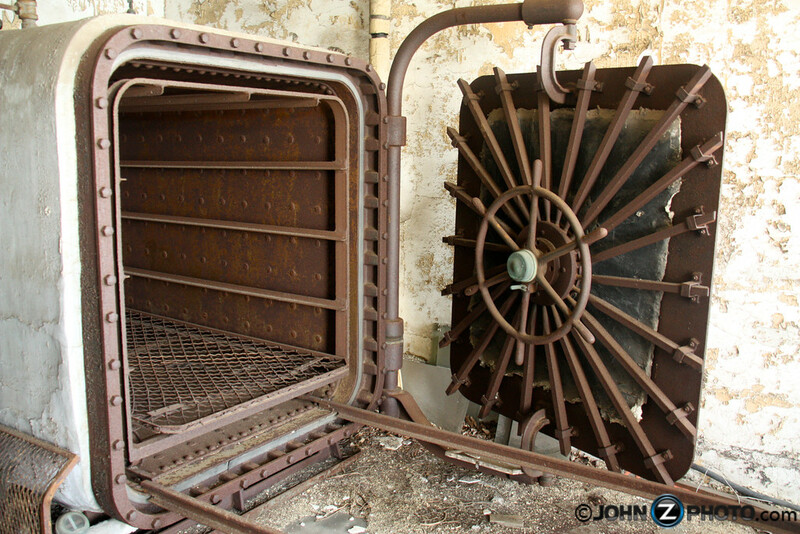 If you take a quick look at this, you would think it was a giant bank vault. But it’s not. 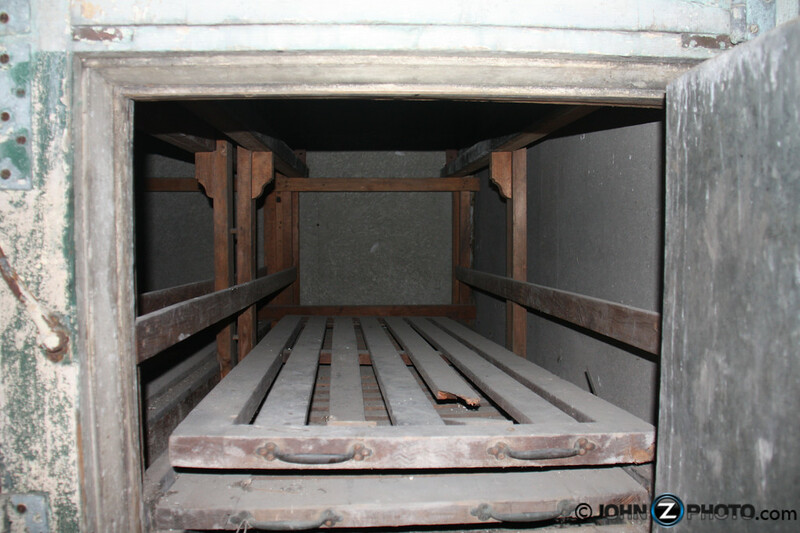 This is a giant auto clave used to sterilize mattresses. 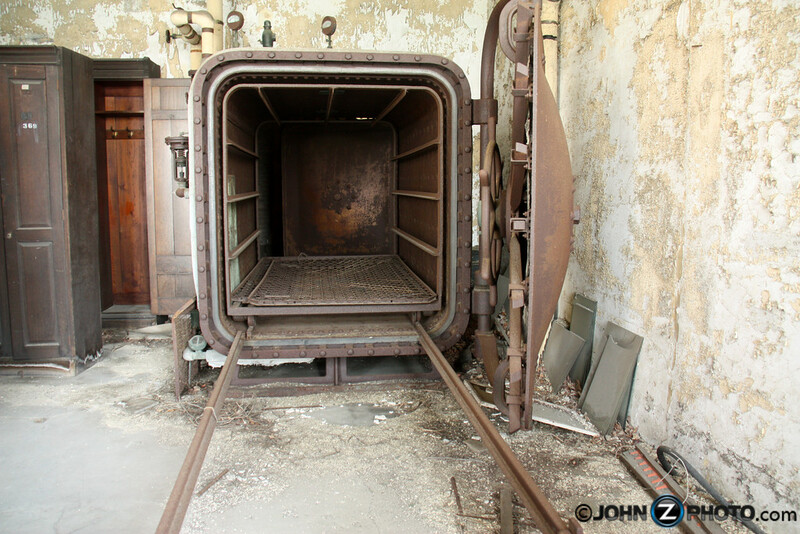 Because there were strict procedures in place to prevent the spread of diseases, the workers would slide entire beds into the auto clave and heat them to extremely high temperatures to kill any germs. 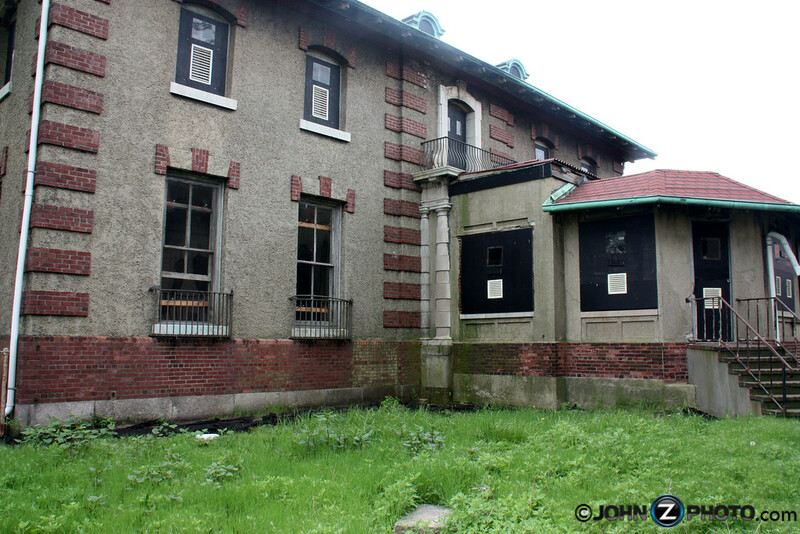 By far, one of the most erie places on the island is the morgue. 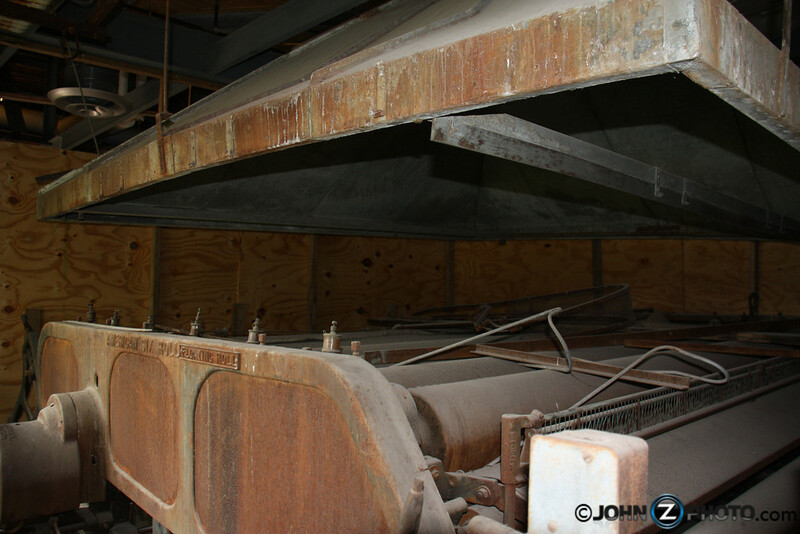 A view inside the refrigeration unit where the bodies were stored. 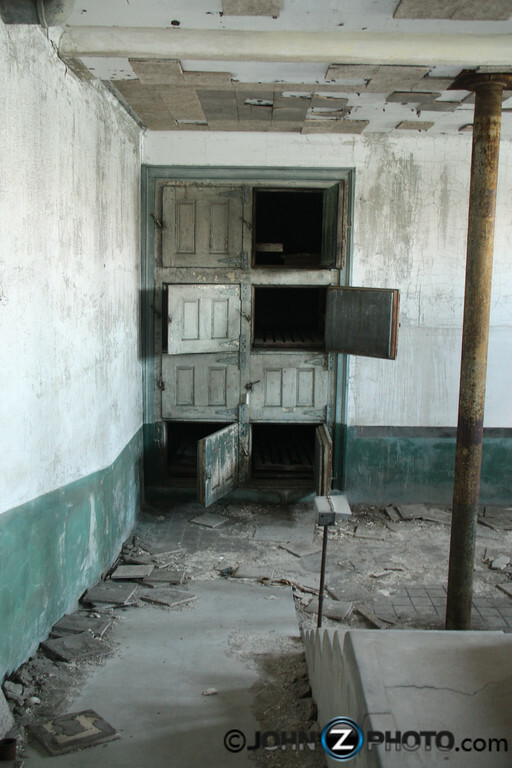 The morgue is setup like a theater with different levels. At the time the complex was one of the most advanced medical facilities in the world. Doctors would come from everywhere to view an autopsy, learn new techniques, or to learn about diseases rarely seen before. There’s that fancy light again just above where the autopsy would be performed. 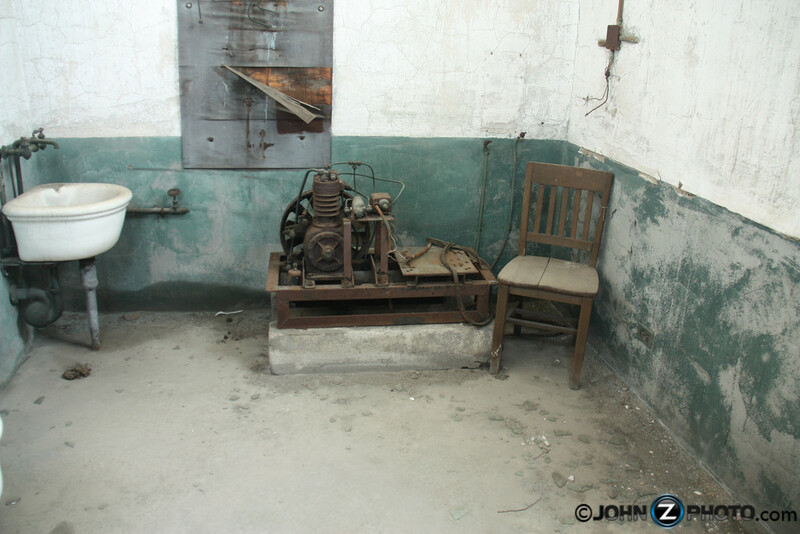 In a room attached to the morgue, it appears that the original compressor for the body refrigeration unit still remains. The crazy thing is, if you look close, you can actually see where one of the maintenance personnel, must have written the part numbers on the wall for the body refrigeration compressor. Back outside, take a close look at this porch. If you’re wondering why it is completely caged, it’s because you’re looking at the psychiatric ward. 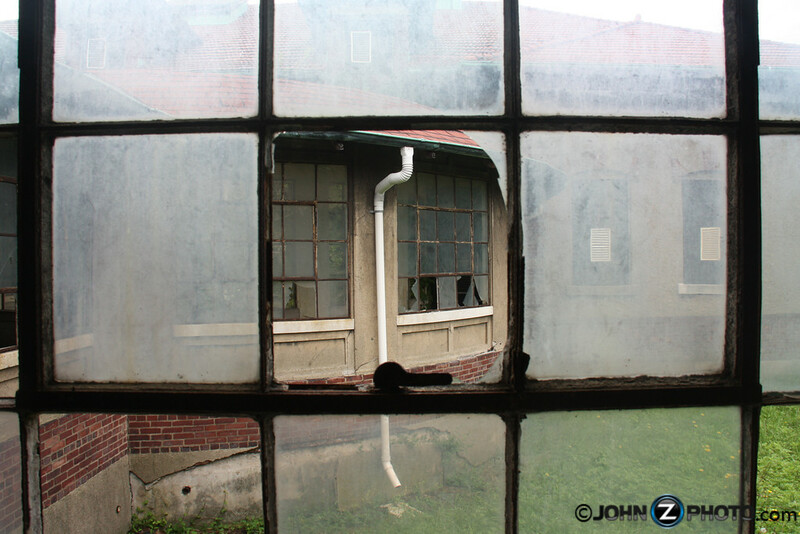 They allowed the patients a certain amount of outdoor time every day, but only on the porch which was completely fenced in. Today, the buildings of the South Side are in rough shape. 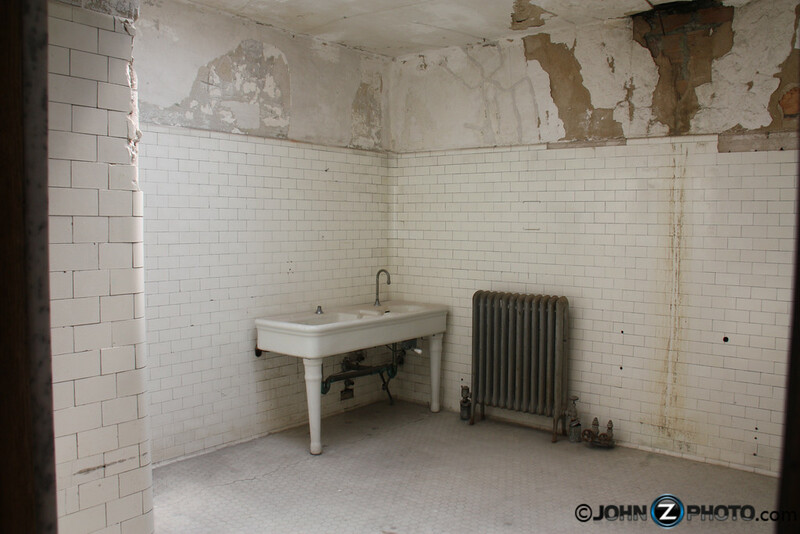 SaveEllisIsland.org is hard at work in an effort to make sure these buildings don’t deteriorate any further and to put them to beneficial public use. Take a look at the corner of this building. It’s strapped together with steal cables to prevent it from collapse. 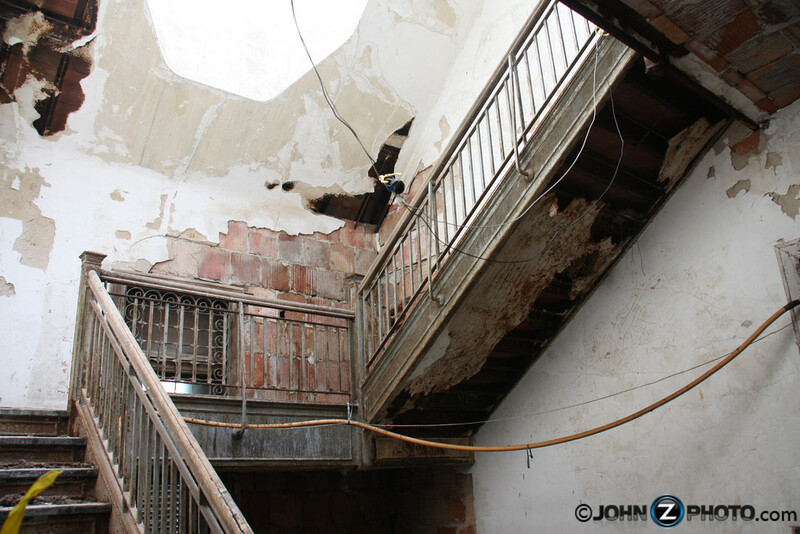 Maintaining and restoring these buildings takes a lot of hardwork and funding. Consider volunteering or donating to SaveEllisIsland.org to help in the effort. This is the main fully restored Immigration Museum on Ellis Island. It’s open to the public daily and contains many exhibits. However, after Hurricane Sandy, many of the exhibits were moved to storage in Washington, DC. 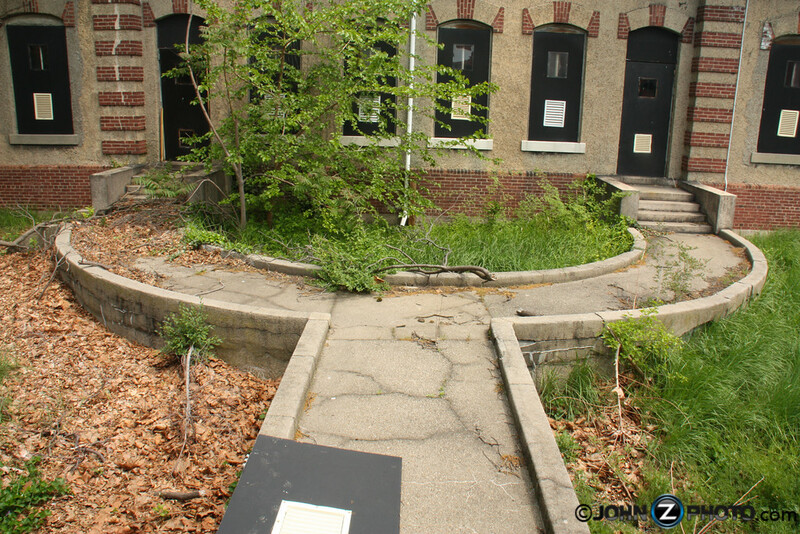 Recently, the National Park Service and Save Ellis Island have opened up portions of the South Side Complex to the public for small guided tours which currently includes an art installation by an artist called JR. Tickets recently went on sale and I am actually scheduled to go on the tour in a few weeks. Click here to see some more examples of JR’s South Side Art Installation like the one below. 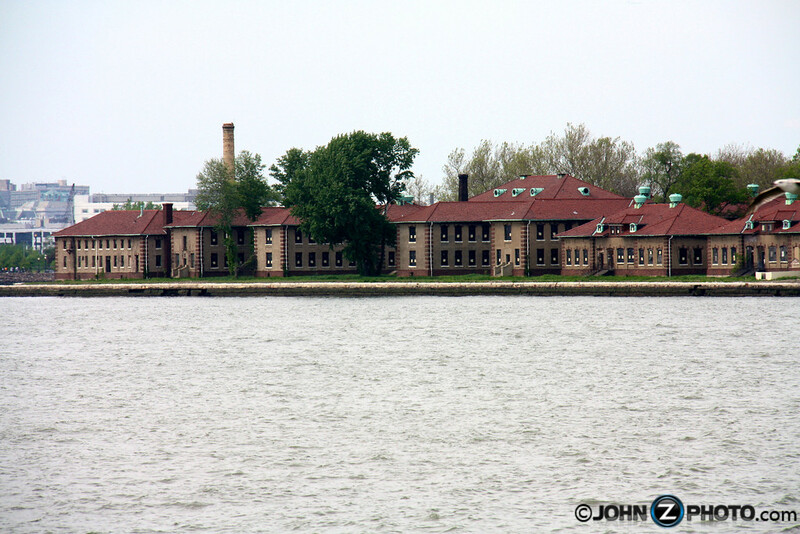 If you’re looking to walk back through history, I would highly recommend signing up for one of these tours here and look for the Ellis Island Hard Hat Tour. This is the only time I’m aware of in the last 60 years that this portion of the island has been opened to the general public. 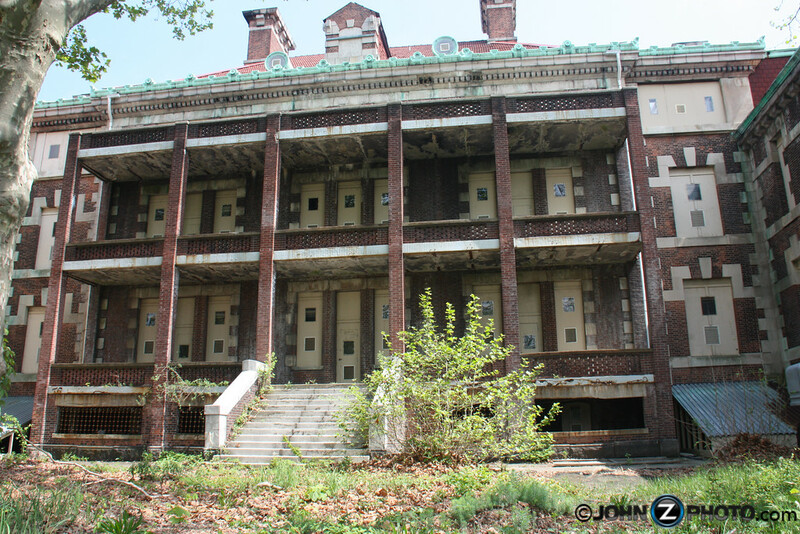 If you’re interested in viewing some truly beautiful images of the south side hospital buildings before they were stabilized, I would highly recommend a book called Ellis Island: Ghosts of Freedom with photographs by Stephen Wilkes. For five years from 1998 to 2003, Stephen Wilkes was allowed exclusive access to photograph the abandoned hospital complex in it’s natural state and images are amazing. Click here to see all of my photos taken during this experience. Share this post on Facebook, Twitter, or leave a comment below. This entry was posted in Abandoned, History, Photography and tagged Abandoned, American History, Ellis Island, Ellis Island Facts, Ellis Island History, Historic Landmark, Historical Ruins, History, History of America, hospital, Immigration, Manhattan, National Landmark, National Park Service, New York City History, Save Ellis Island, US History. Bookmark the permalink. Great visit with you at this location…this is a subject near and dear to my own photographic heart…well done! Thank you. 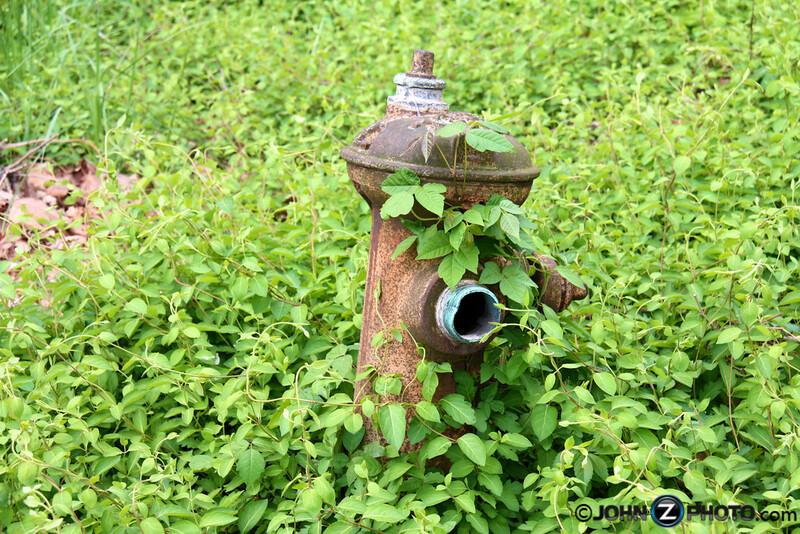 I checked out your blog and you have some fantastic images. Nice work. 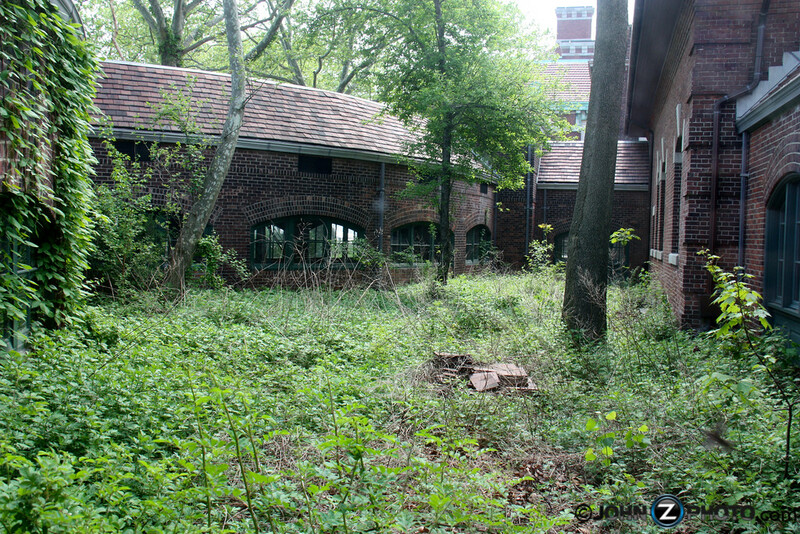 Fascinating glimpse into Ellis Island and these abandoned buildings which were so integral to its history. I enjoyed reading and looking at the photographs! Thanks Vivian. I’m glad you enjoyed and thanks for the note!